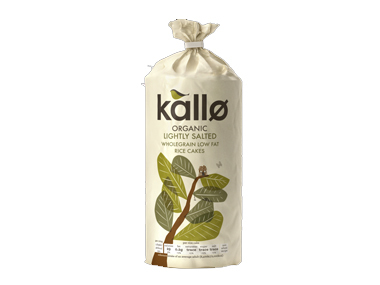 Buy Kallo Organic Lightly Salted Thick Wholegrain Rice Cakes in the UK from our online shop or directly from our independent Scottish store. These organic rice cakes are low fat and only lightly salted. Perfect for an in between snack topped with cottage cheese, vegan cheese or simply enjoy it on its own. Organic wholegrain brown rice (99.75%), sea salt. Allergen Advice: Made in a factory that handles soya. We sell real Kallo and other Gluten free Breads & Biscuits directly from our shop in Scotland and online throughout the UK. View more products from Kallo. Where can you buy real Organic Rice Cakes Salted safely online? If you are wondering where you can buy Kallo Organic Lightly Salted Thick Wholegrain Rice Cakes safely online in the UK, then shop with us. We are an actual health foods shop; with real people selling real foods and products. Our award-winning independent shop is located in Stirling, Scotland since 1976. You can buy our Gluten free Breads & Biscuits in store or safely place an order with us online or over the phone. Organic Rice Cakes Salted - Kallo Organic Lightly Salted Thick Wholegrain Rice Cakes in Gluten free Breads & Biscuits and Biscuits & Breads.